As part of Hyperledger’s mission to advance cross-industry blockchain technologies, we strive to foster talent globally. One way we do this is through a summer internship program. The Hyperledger summer internship program pairs talented university students with blockchain experts from the technical community. Each intern takes on a specific project that will benefit the Hyperledger community and his or her mentor provides guidance to help the intern be successful. 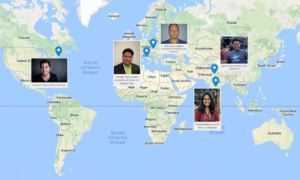 This month, interns from Mexico, Hungary, Italy, and India have completed their internships and will be returning to their university communities to use and share what they have learned. Attila Klenik from Hungary, mentored by László Gönczy from Quanopt and Budapest University of Technology and Economics (BUTE), returns to BUTE. Attila worked on contract-based business process execution. Ezequiel Gomez from Mexico, mentored by Makoto Takemiya from Soramitsu, returns to Boston University. Ezequiel worked on anonymous transactions in Hyperledger Iroha. Indirajith Vijai Ananth from Italy, mentored by Baohua Yang from IBM, returns to University of Rome Tor Vergata. Indirajith worked on improving and implementing features in Hyperledger Cello. Nikhil Chawla from India, mentored by Jiang Feihu from Huawei Technologies, returns to Northern India Engineering College. Nikhil worked on deploying Hyperledger Fabric on Kubernetes using Hyperledger Cello. In upcoming posts about interning at Hyperledger, we’ll share details about the projects and advice for students considering an internship in open source software. We’ll also discuss the important role of mentorship.